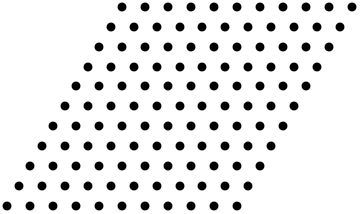 The combinations , with varying and will cover the entire lattice. However, we’re interested only to the points of the lattice that will correspond to colors; say RGB-representable colors. 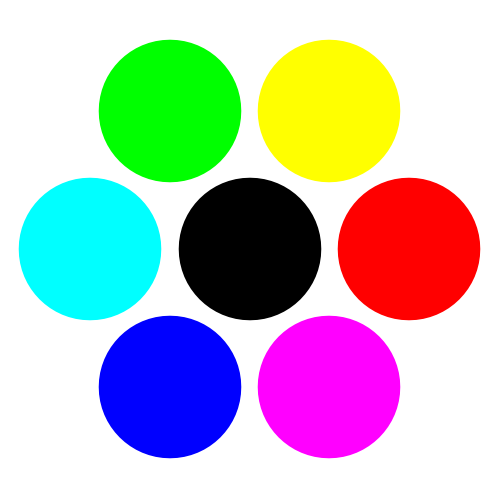 The colorspace might be HSV, but only colors that are mappable to RGB (and our device’s gamut). Remember HSV: the hue is given by the angle made between a point and some reference axis. Each point of the lattice can have its angle measured against some reference vector, say (1,0), that would be red. Distance to origin is saturation and height is brightness. Let’s conveniently say that in 2D, brightness is distance to the origin (up to a radius of 1) and that saturation is always maximal. What varies now is the scale of the grid: if we vary and coarsely, we have few colors, if we vary them finely, we have more. One thing you may notice is that I do not use the norm, but its square root. Why? This gives better contrast—it’s a heuristic observation. Either of the above methods are truly useful when the number of colors remains modest. We’re not very good at distinguishing colors. Maybe only a few tens of colors displayed simultaneously will appear different enough to be useful—we’re much, much better at differentiating brightness. Combining brightness and color maybe a bit better than using only color or only brightness. This entry was posted on Tuesday, July 17th, 2018 at 10:50 am and is filed under algorithms, hacks, Mathematics. You can follow any responses to this entry through the RSS 2.0 feed. You can leave a response, or trackback from your own site.